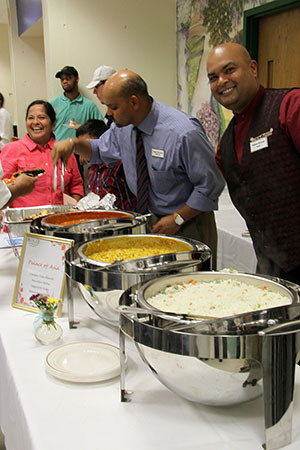 West Windsor, N.J. – It was a night for those who prepare great food – and those who appreciate it. 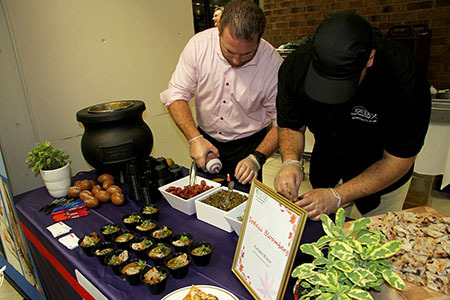 The Hotel, Restaurant and Institution Management (HRIM) program at Mercer County Community College hosted its first Culinary Tasting Event on Oct. 15. 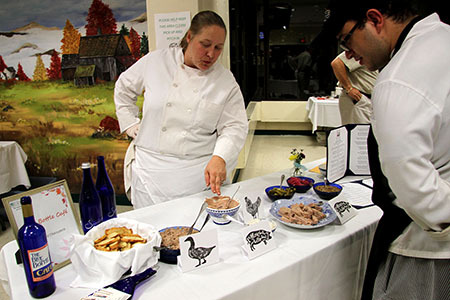 Twenty area restaurants and food service groups, along with four classes from the MCCC Culinary Arts program, participated in a magnificent night for foodies, held in the West Windsor campus cafeteria, which was bedecked with white tablecloths and food stations lining three sides of the room. Despite heavy rain, more than 130 guests came out as many restaurateurs stood ready to serve up some of their most delectable offerings. 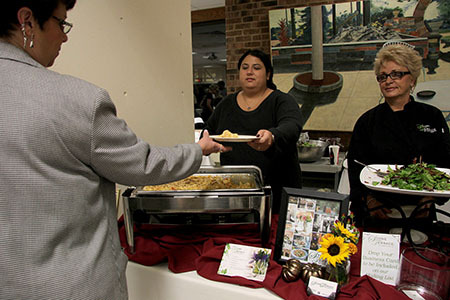 According to HRIM Coordinator Doug Fee, the college’s culinary students are traditionally the first to volunteer with local restaurants at charitable events around the region, and many program alumni and current students are employed by area establishments. “So when we put out the call for restaurants to participate, they did not hesitate,” Fee said. Instructor Frank Benowitz and the MCCC Hospitality Club led the way with logistics and manpower. Participating restaurants included Agricola, Blend/Brothers Pizza, Blue Bottle Café, Jammin’ Crepes, Jersery General Salsa Company, Jersey Girl Café, LiLLiPiES, Nassau Inn, Pure, North End Bistro, Palace of Asia, Sadie Cakes, Small World Coffee, Sono Catering, Stone Terrace by John Henry’s, Teresa’s Café, Terra Momo Bread Company, Toscano, Wegmans and Princeton Westin. Among the wide array of menu items that were both a treat to the eye and a gastronomic delight were pumpkin soup, mini jalapeño quesadillas, tuna tartar, lobster mac ’n cheese, mixed greens with apples, walnuts and cranberries, Italian meatballs, gnocchi, seared scallop spoons, chicken tikka masala, vegetable pulao, poached salmon, and a variety of meats, cheeses, breads, olives and spreads. Desserts were also plentiful. Samplings included pumpkin spice donuts with maple icing, fruit pastries, crumb cake, parfaits, cookies, scones, meringues and an assortment of mini-cupcakes. Small World Café served up fresh-brewed coffee to complement the desserts. Benowitz says the event literally went from concept to reality in six weeks. 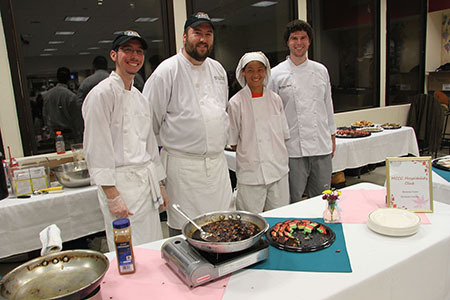 Students in the Food Prep II class took an active role in preparing gourmet seafood dishes, while Baking I students made madeleines, Chef Lumberger’s specialty, and Baking II students contributed Chef Widmayer’s rainbow cookies. The event featured a silent auction. 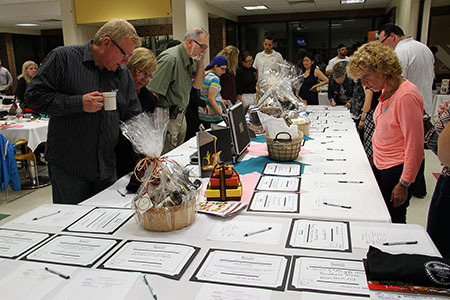 The bidding was brisk for numerous donated items, including gift certificates for restaurants, hotels, massages, gift baskets, and gourmet chocolates. Benowitz reports that the evening far exceeded everyone’s expectations. “We are extremely appreciative and grateful to everyone involved. 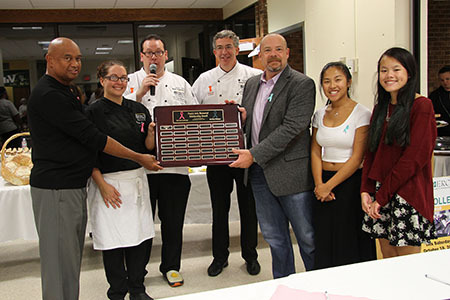 They went above and beyond and it resulted in a wonderfully special night for a very worthy cause," Benowitz said, adding that the tasting is expected to become an annual event at the college. Palace of Asia served Indian specialties. They liked it! 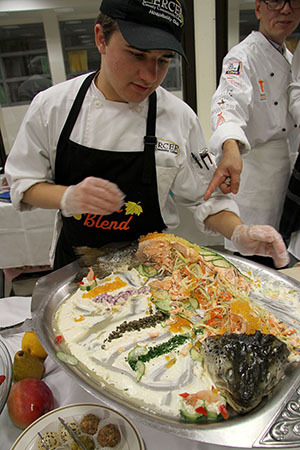 Students prepared a platter of poached salmon with condiments that was very popular with the crowd. Small World Cafe served up individually brewed cups of coffee. MCCC culinary students prepared their signature Bananas Foster. 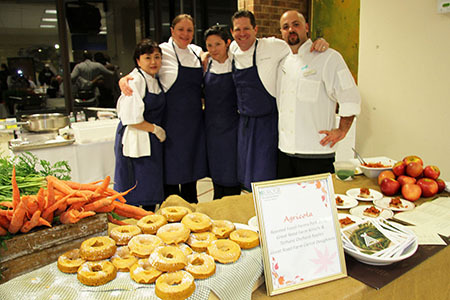 Agricola's Executive Chef Josh Thomsen (2nd from right) with staff. Their offerings included pumpkin spice donuts with maple icing. Scholarship recipient Natalie Russano, second from left, is pictured with David Lumberger, Chef Frank Benowitz, Chef Doug Fee, Don Widmayer and the Widmayers' daughters, Hannah and Lillie. 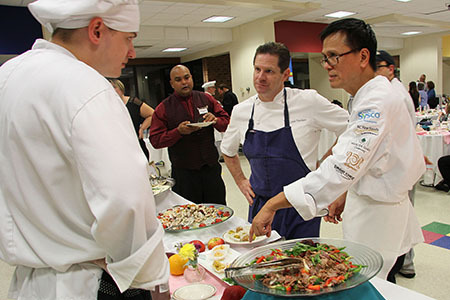 MCCC's Chef Benson Yu and Agricola Chef Josh Thomsen talk with a culinary student. 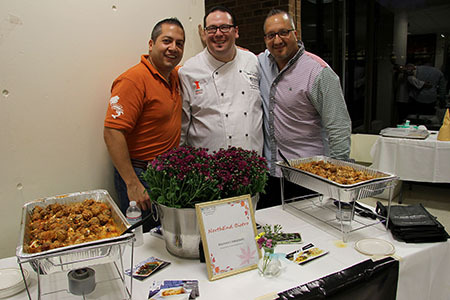 Chefs from North End Bistro (Princeton) with MCCC instructor Frank Benowitz (center). 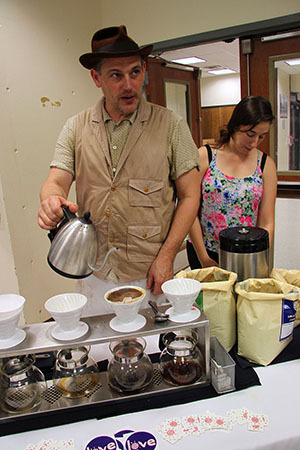 Blue Bottle Cafe (Hopewell) chef and owner Rory Philipson, an adjunct instructor at Mercer. Stone Terrace served lobster mac 'n cheese, accompanied by salad. The silent auction featured a variety of gift certificates and food baskets. Sodexo Bloomberg served a sampling of perfect pumpkin soup.